The Memphis Grizzlies and BlueCross BlueShield of Tennessee are continuing the annual tradition of encouraging Grizzlies fans to consider alternative and healthy choices by taking part in the 10th Annual Tour de Grizz on Sunday, April 7 before the Grizzlies tip-off against the Dallas Mavericks at 5 p.m. at FedExForum. 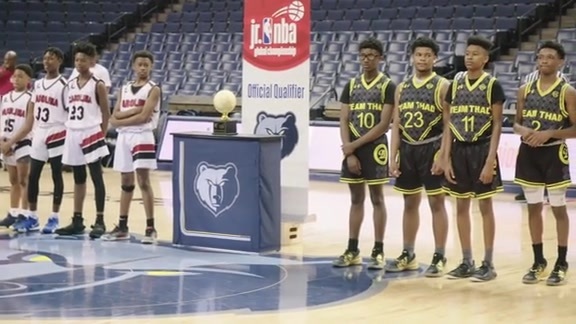 Packages start at just $25 per person and include a ticket to the game, a Memphis Police Department escorted bike ride to and from the game and a Tour de Grizz Dri-Fit T-Shirt to commemorate the event. Participants are encouraged to join the group prior to the ride for music and entertainment from 2:30 – 3:30 p.m. at River Garden Park (51 Riverside Drive) before hopping on their bikes for a three and a half mile ride to FedExForum to see the Grizzlies take the court. Riders in the Tour de Grizz will depart from River Garden Park at 3:45 p.m. and will be accompanied by MPD escorts to ensure the safety of all participants as they make the trip to and from FedExForum. Once the riders have reached the arena, they will have complimentary “Bike Valet Parking.” Following the game, fans will be invited to participate in a more direct one-mile group ride back to the park. Riders are suggested to park their cars on the south side of the Tennessee Welcome Center (191 Riverside Dr.) just north of River Garden Park before the event begins. All participants must be at least 10 years of age to ride their own bike and are required to provide their own bike and safety equipment, including a helmet and lights. The 10th Annual Tour de Grizz will take place rain or shine. Fans who have already purchased a ticket for the April 7 game against the Mavericks are also invited to join the ride by calling (901) 205-1436 or by visiting grizzlies.com. Fans who want to support the Memphis Grizzlies and purchase tickets to the Grizzlies’ remaining contests of the 2018/19 season may do so now by calling (901) 888-HOOP or going online to grizzlies.com/tickets. For more information on the Grizzlies, ‘like’ Memphis Grizzlies on Facebook or follow on Twitter and Instagram (@memgrizz).